We’d love your help. Let us know what’s wrong with this preview of See You in the Cosmos, Carl Sagan by Jack Cheng. 11-year-old Alex Petroski loves space and rockets, his mom, his brother, and his dog Carl Sagan—named for his hero, the real-life astronomer. All he w A space-obsessed boy and his dog, Carl Sagan, take a journey toward family, love, hope, and awe in this funny and moving novel for fans of Counting by 7s, Walk Two Moons, and The Curious Incident of the Dog in the Night-Time. 11-year-old Alex Petroski loves space and rockets, his mom, his brother, and his dog Carl Sagan—named for his hero, the real-life astronomer. All he wants is to launch his golden iPod into space the way Carl Sagan (the man, not the dog) launched his Golden Record on the Voyager spacecraft in 1977. From Colorado to New Mexico, Las Vegas to L.A., Alex records a journey on his iPod to show other lifeforms what life on earth, his earth, is like. But his destination keeps changing. And the funny, lost, remarkable people he meets along the way can only partially prepare him for the secrets he'll uncover—from the truth about his long-dead dad to the fact that, for a kid with a troubled mom and a mostly not-around brother, he has way more family than he ever knew. To ask other readers questions about See You in the Cosmos, Carl Sagan, please sign up. is there going to bee a sequel? The moment I started SEE YOU IN THE COSMOS, I knew I would be reading something different. Something original. I don’t know about you, but I haven’t read a thousand books that make space for rockets in their plot, let alone mention them. I’m not what you would call a science geek, but I welcome variety. Alex, however, adores rockets. He’s only eleven years old, yet he already built his own rocket he strongly hopes will make him win the Southwest High-Altitude Rocket Festival or SHARF. Sadly, he h The moment I started SEE YOU IN THE COSMOS, I knew I would be reading something different. Something original. Sadly, he has to go alone, because his mother won’t take him and his older brother is mostly absent. I wasn’t too keen on the idea of Alex traveling with strangers, especially adult strangers, but he did it anyway. Kids don’t listen to me. I’m not adamant enough in my speeches, I guess. I was surprised to see him take such reckless decisions, because to me he seemed like an intelligent eleven-year-old boy who understands more than the average eleven-year-old boy would. And I thought it was imbedded in everyone’s minds that strangers should not be trusted so easily. But okay. Though despite the every-parent’s-nightmare situation, I enjoyed most of this novel. I probably would have enjoyed it more had I cared even a little about rockets, but unfortunately I do not. There’s a lovely atmosphere in the story. I may not be one for looking at miniature space ships fly in the air, but I am one for animals, so I loved dear Carl Sagan (not the scientist, ha-ha!). I also thought Alex’s recordings were interesting. Instead of chapters, we have ‘‘recordings.’’ By that I mean Alex is recording himself talking about his love of science and his adventures. He very much likes to record sounds, too – and not the voice type! For instance, he wishes to record the heartbeat of a man in love. How adorable is that? Quite random, but sweet. Not a perfect book, but Alex is a kid worth meeting with a quest as strange as it is admirable. Such pleasure to be on this journey with Alex and Carl Sagan. 🚀 Tons more enjoyable than I expected! Since the story was told by Alex, an 11 year-old boy with responsibility level of at least a 13 year-old, we were limited in knowing several stuff ex: the older kid from the train (what happened to him there??) or with Terra and Steve. And we didn't delve into Seth's vow of silence early on either. But the 'diary' format suited the audiobook perfectly. Each chapter was recorded with background sound and everything. The narrator for our lovely Alex was absolutely incredible! Such adorable voice and the emotions were spot on throughout the whole book. "Hello guys, This is Hirdesh and I was reading SEE YOU IN THE COSMOS AND I loved it." Recommends it for: anyone I can browbeat into reading it; yes, it's that good! It’s a cliché to say about a book that you didn’t want it to end, but sometimes the cliché is the truth. So it is with this middle-grade book like no other, one that children and adults alike will adore. Science geek Alex Petroski would be the first to point out that his real age may be 11, but his “responsibility age” would be much, much older. And, readers, you will agree with him. His father died when Alex was 3, his older brother — 24-year-old Ronnie, a college sports star turned sports agent It’s a cliché to say about a book that you didn’t want it to end, but sometimes the cliché is the truth. So it is with this middle-grade book like no other, one that children and adults alike will adore. Then I took him back to my house and my mom was lying on the sofa watching her shows like she usually does, and I told her I got the groceries but I got a pup also and I’ll take good care of him I promise, I’ll play with him and feed him and give him a bath and all the stuff you’re supposed to say. So you see how it is. Brother Ronnie moved to Los Angeles and, while he pays the bills for his mother and little brother, Ronnie hasn’t visited in more than a year; Alex has pretty much been on his own. Alex wants to emulate Dr. Sagan and the Golden Record he launched into space in 1977 in the hopes of announcing our human presence to any alien life. Alex gets a donated iPod, spray-paints it gold, transfers the information from Sagan’s Golden Record onto it and adds additional entries in which he makes observations on the human condition for the aliens’ edification. When Alex decides to make the journey from Rockview, Colorado, to the Southwest High-Altitude Rocket Festival (SHARF) in Albuquerque so as to launch his Golden iPod into space aboard Voyager 3, there’s no adult who’s going to dissuade him. Along the way to Albuquerque (and beyond), Alex fortuitously for him finds himself relying on the kindness of quite a few strangers — and, fortuitously for us, he captures his adventures in a series of daily recordings along the way. Author Jack Cheng hooked me from the very first transmission chapter with this heart-warming tale of a boy who reaches for the stars and finds more than he ever imagined. Highly, highly, highly recommended. there are not enough stars in the cosmos! This book is just precious, precious, and precious! EVERY HUMAN IN THE UNIVERSE NEEDS TO READ THIS BOOK. ESPECIALLY KIDS! I'm so elated now after finishing this book I feel like one of those whimsical red balloons drifting away in the sky. I’m not only buying this book for my kids but I'm buying a bunch of books so I can go around handing them over. there are not enough stars in the cosmos! I’m not only buying this book for my kids but I'm buying a bunch of books so I can go around handing them over. If I could I'll attack one to a rocket and send it up so the aliens can read it too. And this book will go in the same shelf with the other timeless priceless gems I’m buying: the Little Prince , The Alchemist , Wonder and Harry Potter . People don’t make me ask you again. Read this book. You gotta read this book! I personally just want to read this book forever, until the end of time. It will be my never-ending story, like the cosmos. This book is written from Alex’s POV and I fell, irremediably and idiotically, in love with his voice. It reminded me of Butterfly during our hiking adventures. She holds my hand and takes me for a walk [yup, SHE takes ME for a walk. That’s how it is with her] while she chats incessantly about EVERYTHING. EVERY SINGLE TOPIC UNDER THE SUN: the woods, the plants, the flowers, the butterflies flying around the flowers, the birds that chase those butterflies, the sky where those birds fly, the stars above the sky and all the worlds around those stars. AND I LOVE ALEX AND I AM ADOPTING HIM TOO! I had been reading maniacally for weeks and I had to take a break after this book and wait for its assimilation into my soul to be completed. My soul and this book were FULLY assimilated. Resistance was futile! What about you? Do you ever have stream of consciousness like Alex’s? Do you record them in an iPod? When are you launching your rocket to the universe? Bookworm, book blogger, writer, collector of stories that matter and passionate about diversity and equality [especially feminism!]. I received this in exchange for an honest review from NetGalley. Thank you to he author, Jack Cheng, and the publisher, Dial Books, for this opportunity. This follows the journey of 11-year-old space-obsessed Alex Petroski, and his dog Carl Sagan, as they travel to a space camp to launch their home-made rocket. There Alex attempts to emulate his hero, the real-life astronomer Carl Sagan, and launch his golden IPod, containing all his recorded musings about life on Earth, into space. The journey he I received this in exchange for an honest review from NetGalley. Thank you to he author, Jack Cheng, and the publisher, Dial Books, for this opportunity. The journey he undertakes proves a far more complicated one than just his geographical travel. Along the way the reader learns more about Alex and the world he inhabits. 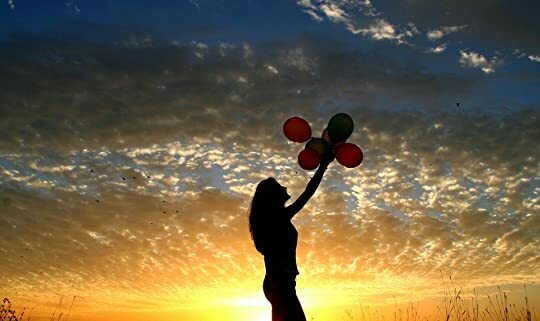 This understanding is broadened by the meeting of other lost souls, who prove that age and happiness are not synonymous and that love can take many forms. I enjoyed seeing the world through the eyes of one so young. In some instances this reminded me somewhat of To Kill a Mockingbird, where the emphasis was on reading between the gaps of this young understanding. Alex did not always tell all the reader ended up learning from this story. This is dually also what caused my discontent, whilst reading this. I found Alex quite a difficult character to penetrate. I felt such sadness for him and yet, also, found him to be quite annoying. I felt so horrible for feeling this way for one so young and so lost in the world! I could not help but feel too old to properly appreciate his perspective on the world. His constant questioning and running monologue was true to his age but sometimes ended up boring me and, thus, ended in a loss of affinity towards his character. This was a very sweet story aimed at the middle grade market. The main character Alex is an eleven year old boy (but with a responsibility age of 13!) who is passionate about all things space and rocket related. His hero is the astronomer Carl Sagan after whom he names his pet dog. The inspiration for the format of this book comes from the Voyager Golden Records. These were recordings chosen by Carl Sagan and an expert panel to be representative of life on Earth and sent into space on board the This was a very sweet story aimed at the middle grade market. The main character Alex is an eleven year old boy (but with a responsibility age of 13!) who is passionate about all things space and rocket related. His hero is the astronomer Carl Sagan after whom he names his pet dog. The inspiration for the format of this book comes from the Voyager Golden Records. These were recordings chosen by Carl Sagan and an expert panel to be representative of life on Earth and sent into space on board the Voyager spacecraft in 1977 as an introduction to human civilisation to any extraterrestrial sapient life forms. In this book, Alex creates his own recordings using a golden iPod with the intention of sending them into space onboard a homemade rocket and each chapter is a transcript of these recordings. Alex is a brilliant main character. He is so full of wise questions and amazing knowledge and yet is still so beautifully innocent and naïve. It is this innocence and naïvety that leads him to take off on the adventure of a lifetime with his trusted canine companion alongside without regard for consequence or safety. This adventure leads him to among other things an amateur rocket launch; it leads him to discovering more about his deceased father, and brings his quiet home life into the spotlight and reveals just how much this young boy has been dealing with at home with a mentally ill mother. The cast of characters Alex meets along the way are also incredibly beautifully written with how we really only see them through the eyes of this special eleven year old boy. This is a story that is tinged with bittersweetness but ultimately is a triumph of Alex's indomitable hope and optimism. He truly is a very special main character who at times can feel wise beyond his years and others, perfectly unmarred by the harshness of life. I am very sure that I would have loved this book as a 10 year old because of how it views the world and in particular the curious behaviour of adults through the eyes of a wonderful young boy. The adult version of me fell head over heels in love with the canine Carl Sagan and I can 100% guarantee that my younger self would have been equally bonkers! The book is also filled with a wonderful sense of humour that would endear itself to any child and indeed any adult who is still a child at heart. *SIGH* File this one under 'disappointing reads of 2017'. I first heard about this book at a Penguin Teen event I went to in January and thought it sounded super cute so when it came out I picked it up. The story follows our eleven year-old main character who is space obsessed and wants to launch a golden ipod into space (Carl Sagan and Nasa once sent a Golden record). He ends up going on this BIIIGG journey and meeting a bunch of people and 'discovering himself' and stuff but I just didn't particularly enjoy this. - THE FORMATTING EUGH. Okay so the entire book is told in the 'voice recordings' on his ipod so that when he sends it into space the aliens can know about his life. It's a cute concept but reading it is really frustrating and by about the 50 page mark it was driving me crazy. It read like this "so I said let's go to the shops because then we can get ice cream and Joe said that's not a good idea because it's only an hour before dinner and I said that's no fun do you guys have ice cream on your planet if you don't it's this really cold stuff that comes in all different flavours and my favourite flavour is rainbow which Mikey from school says is for girls but I don't agree." It just keeps going like that!! There's no quotation marks to indicate speech and it's just this running commentary from a young character which got really annoying especially because he repeats himself so much. I'm sure a lot of people would find it charming but I did not! - This book used a trope that I hate... the absent family trope! Normally this is only seen in YA books so teens can go out partying and their parents never protest. In this book and 11 year old kid goes on a road trip and his mum doesn't object and his brother (who lives interstate) doesn't call to check how things are going or anything! It really bothered me especially when it turned into a longer trip I was like ??? why aren't people concerned about you? The family thing does kind of get explained near the end but it was still not great in my opinion. - Also all the adults he met on his trip were completely cool with the fact that an UNESCORTED CHILD was wandering around. No one called the police or anything! People even helped him. I WAS SO CONFUSED! Like yeah he's mature for his age but HE IS STILL ONLY 11!! - Mental illness (specifically schizophrenia) is introduced to the story pretty late and I felt like it was kind of just thrown in there randomly as an excuse for a character being absent in the story which I didn't like. 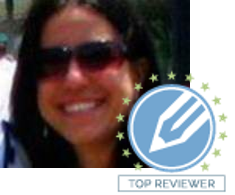 I don't think it was handled particularly well but others might not agree so I don't know. - The supporting characters were all pretty meh. I found them to be a little flat. I also found it to be SUPER WEIRD that these adults dropped their lives to help some random child on his quest. Like... isn't that kind of weird? Shouldn't you be more concerned about why he isn't with his family? Am I the only one that thinks this haha? - The dog that is on the cover is missing for half of the story so THIS BOOK IS FALSE ADVERTISING! - Finally I think Alex (the child main character) is written as WAY older than 11. There were some moments where he would say annoyingly profound things and adults would be all 'wow ur so smrt' but I'm over here like no child would ever say that so I don't know it just felt very obvious that this was an adult trying to write as a child ya feel? This was a cute book, although some of the events were a little unbelievable. It kept my attention and I was rooting for Alex. I listened to the audio version. The audio version had more than just narration. It had other background noises, reminiscent of an old radio program. This was such a fun read. I wasn't sure what to expect but I really enjoyed this book a lot. I really loved the narrative and Alex is such a cool character. His family life is so sad but it was heartbreaking how he didn't seem to notice how anything was off with his family. He was such a happy kid with his cute dog. I really appreciated how it mentioned within the first few pages that Alex is a POC. The characters are all amazing and I loved them. Jack Cheng wrote such a fun cast of characters a This was such a fun read. I wasn't sure what to expect but I really enjoyed this book a lot. The characters are all amazing and I loved them. 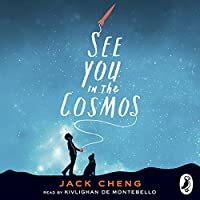 Jack Cheng wrote such a fun cast of characters and I think that's the best part of See You in the Cosmos. I listened to this one as an audiobook which I think was a fantastic decision considering this story is told through audio recordings that our young protagonist Alex is creating on his iPod so that he can send it into space for aliens to find and learn more about planet Earth. I didn't read the synopsis before starting this one so I was unaware of the format, but it just worked so perfectly as an audiobook. There were multiple voice actors as well as sound effects which made these recordings feel super realistic and believable. While this book started out quite light, it quickly started to turn into something more complicated and heartbreaking. We start to learn more about Alex's home life and how it may not be what it seems. I LOVED this book. Even when I was only halfway through, I was recommending it to people. So good. It was fun, it was adventurous, it was even suspenseful at times! I listened to this as an audiobook and the cast was SO good, too. Much like the physical book, the audiobook is set up as recordings on the Golden iPod. I thought that was very interesting. There are times when it's live and in the moment, and times when Alex is relaying something that had just happened or memories from when he was y I LOVED this book. Even when I was only halfway through, I was recommending it to people. So good. It was fun, it was adventurous, it was even suspenseful at times! I listened to this as an audiobook and the cast was SO good, too. Much like the physical book, the audiobook is set up as recordings on the Golden iPod. I thought that was very interesting. There are times when it's live and in the moment, and times when Alex is relaying something that had just happened or memories from when he was younger that tie into the story. There are a lot of things that happen in this book, but they fit together so well. From Alex going to New Mexico for the rocket launch to meeting Terra to going to LA to find his brother to going back home and finding his mom is missing. Did I mention there's quite a bit of suspense and adventure? This book is just so special. There are some conversations that seem very big for an 11 year old, but Alex is such an amazing kid. alex = cute, sweet, innocent, genius, honest, intelligent, adorable, responsible. entire book is in form of recordings. so heartfelt & brave. we get to know about his life, his family, his friends, his passion, his dog, his road trip & so on. entire book is so original, honest & innocent. i loved the writing style so much, totally suitable for alex & his journey. I was absolutely mesmerized by this book! Eleven-year-old Alex Petroski wants to launch his golden iPod into space, just like his hero Carl Sagan launched his Golden Record on a spacecraft in the 1970s. Alex spray paints his iPod with gold paint and sets off to capturing the sounds of life, so that extraterrestrial creatures that find his iPod will know what life is like on earth. Alex plans to launch his iPod at a rocket competition in the middle of the desert, and he has made just the right ro I was absolutely mesmerized by this book! Eleven-year-old Alex Petroski wants to launch his golden iPod into space, just like his hero Carl Sagan launched his Golden Record on a spacecraft in the 1970s. Alex spray paints his iPod with gold paint and sets off to capturing the sounds of life, so that extraterrestrial creatures that find his iPod will know what life is like on earth. Alex plans to launch his iPod at a rocket competition in the middle of the desert, and he has made just the right rocket to get it into space. Told entirely through his iPod recordings, we listen as Alex sets off from home with his dog, also named Carl Sagan, and the innovative and often heartbreaking trip he takes on his own and the strangers and family members he meets along the way. Mr. Cheng’s incredible storytelling reaffirmed my belief that creativity is still very much alive in children’s literature. A wonderful read for middle grade-aged readers and beyond! I already have a list of people I want to give this book to. Una historia llena de sensibilidad e inocencia, a la vez que de sueños por cumplir y esperanza. Sin duda, un relato que hará reflexionar y emocionar al lector a partes iguales y que no le dejará indiferente. See You in the Cosmos is written as a series of recordings, made by Alex Petroski, emulating his hero, Carl Sagan, who sent the Golden Record into space. The story follows Alex as he first treks to a rocket convention, and then home (via a circuitous route), finding new friends and family along the way. I genuinely don't know how to describe this book. It's a wonderful read, though very emotional, and made even more so by dint of being from Alex's point of view. There were several parts which had me near tears. It may be marketed as a middle grade book, but I think that it's one everyone can read and enjoy. The characters are also amazing, and I loved every single one of them. They're wonderfully flawed human, and best of all, they're realistic. On occasion, I feel like books aimed at younger children try to simplify things overly, but this book didn't have that problem. It has discussions about love, and family, and even touches on mental illnesses. 5 estrelas pela melhor experiência de audiobook que já tive. Fez toda a diferença pra história e foi incrível. This was a FANTASTIC audiobook! Check it out if you're looking for a great book to listen to. See You in the Cosmos is a gorgeous, heartwarming middle-grade novel, with a decent helping of rocket-related passion at its core. People used to ask my hero stuff like that too. They’d say, We have so many problems here on Earth, we have global warming and was in the Middle East and kids in Africa who don’t have food or clean water, so why should we try to go to Mars or communicate with extra-terrestrial intelligence when we can’t even solve all the problems we have on our own planet? And do you know what my hero said to those people? He told them to think about what it would mean if we went to Mars. He said if we can do something that big, something that’s never been done before in the history of humanity, then of course we can solve all the problems we have at home, DUH! And I agree. But in addition to that, this is a story about family, finding your place in the world, and searching for the real truth. It’s about friendship, and adventure, and finding things that you maybe weren’t looking for when you set out but realise are way more important than the things you went looking for in the first place. Hai, Alex. Ini Upi. Kakak Upi. I am almost 29 and you're still 11 yo. Jadi kayaknya Tante Upi yang paling bener. Rekaman suara kamu udah sampe ke... Rancaekek. Terima kasih udah buat rekaman suara bumi ke sini. Bumi kamu. Dunia kamu. Tante nangis sampe gagal move on semaleman abis denger rekaman suara kamu. Hati Tante emang rapuh kayak kembang tahu. Denger cerita kamu, masih 11 taun tapi udah ditinggal ayah, ditinggal kakak kerja di luar kota mana kakak kamu cuek bat ih pengen noyor deh Hai, Alex. Ini Upi. Kakak Upi. I am almost 29 and you're still 11 yo. Jadi kayaknya Tante Upi yang paling bener. Rekaman suara kamu udah sampe ke... Rancaekek. Terima kasih udah buat rekaman suara bumi ke sini. Bumi kamu. Dunia kamu. Tante nangis sampe gagal move on semaleman abis denger rekaman suara kamu. Hati Tante emang rapuh kayak kembang tahu. Denger cerita kamu, masih 11 taun tapi udah ditinggal ayah, ditinggal kakak kerja di luar kota mana kakak kamu cuek bat ih pengen noyor deh kadang, sendirian ngurus ibu yang punya gangguan kejiwaan, hati Tante langsung remek. Hancur lebur berdebu-debu. But, Alex, besides everything, you are still kids. Punya mimpi luar biasa yang kadang buat kami orang dewasa cenderung halu, berusaha sekuat tenaga dengan optimisme dan keyakinan pasti akan berhasil yang mana kami orang dewasa udah ga banyak yang punya. Lebih-lebih lagi kamu anak pinter! Kamu tau Star Wars (you know what? I always give more credit to people who loves Star Wars! ), kamu tau banyak astonomy jokes yang banyak orang ga paham, kamu tau gimana harus ngurus ibu kamu dan Carl Sagan sekaligus, dan imajinasi kamu luar biasa sekali. Segalanya, ditambah kepolosan dan keluguan khas anak-anak kamu, bikin tante pengen adopsi kamu, bahkan sejak bab pertama buku ini. I love you soooooooooo much, Alex Petroski. Mengikuti rekaman kamu, gimana kamu berusaha nyari kebenaran, bagimana kebenaran kemudian menghantam kamu karena ternyata tidak seindah harapan, gimana kamu menghadapi kebenaran itu dengan sikap sepolos, selugu, dan sepintar biasanya, semuanya bikin tante baca buku ini sambil ngusap-ngusap mata (karena nangis haru) dan perut sambil sesekali bilang 'aamiin'. Tante emang seimajinatif kamu kadang-kadang. Pada akhirnya, Alex, Zed bener. Tante rasa kamu udah dapetin semua yang mau kamu rekam di iPod kamu. One day, if your iPod is going to space, the Others, the Aliens, will hear so many things from your recordings. It's sounds of bravery, truth, and mostly love. Ubedljivo najlošija iz Deretine “ciglaste” edicije. 2,5 zvezdice, mada sam bila u iskušenju da zalepim jednu koliko je knjiga u nekim delovima bila naporna. Such an original plot and choice of delivery in terms of the writing. I laughed out loud a few times, chuckled quite a bit and even shed a tear once or twice. If a book can bring all this out of me then I usually consider my time well spent! I recommend this book to anyone looking for an uncomplicated, easy read that is something quite different from the usual books out there. One issue I had with the book was that Alex was naïve and seemed more like a six year old but three in responsibility years. Woah! Just... woah! What an incredie book! I really want everybody to read this mesmerising story! I picked it up when I saw it was nominated for the Goodreads Choice Awards this year, and I am so glad that I did. This book is told in a series of recordings 11-year-old Alex has made on his iPod, which he plans to send into outer space on a rocket he's building. He's making the recordings so that the aliens can get an idea of what it's like being a human on Earth. Normally I immensely dislike unusu Woah! Just... woah! What an incredie book! I really want everybody to read this mesmerising story! Normally I immensely dislike unusual formats, and I was skeptical when I saw it was a series of recording transcripts, but this was absolutely perfect! Alex is such a brilliant protagonist! He has a huge personality, a dog called Carl Sagan, and a love of all things to do with rockets and outer space. And even though he's only eleven, he's at least thirteen in responsibility years! Seeing the events through his eyes was fantastic! He is innocent in that he doesn't understand some of what's going on around him, but not in the sense that he's clueless. A lot of the time it's because people won't tell him anything rather than the fact that he can't understand. It was enlightening, fresh and fantastic to read from the perspective of a younger child. His story is also great. He has his share of struggles, but he always pulls through. The story was so heartfelt, and Alex is always so brave, even when everything around him is crumbling. The entire cast of characters was also perfect! Zed was awesome. I don't even know what to say about him. He was just awesome. And Terra was also brilliant, I loved seeing her character unfold as the story progressed. Be warned though, it is quite sad in many places. But it was a brilliant journey and I absolutely loved this book! It was funny, cute, sad, real, and just all-round incredible! Definitely recommend! I wish everybody would read this! Miksi en antaisi viisi tähteä kun kuitenkin pidin tästä kuin hullu puurosta tai jotain. Jotain samaa tässä kirjassa kuin Ihme ja Mitä sain tietää meduusoista kirjoissa. Koskettava ja mieleenjäävä vaikka ei olisi supersuosittu vinkkauksissa. Settiin silti. A Space obsessed Kid with his Dog Carl Sagan explores a series of events eventually leading to a kind of ending that makes the readers feel happy and appreciable for the life they had through this 320 page work. Normally I prefer Nonfiction over Fiction with an exception when it is science based or inspired. And this book is my first YA kind, at first the cover impressed me and after reading the description, i felt confident enough to try it and I'm glad i did it. It's very different from the co A Space obsessed Kid with his Dog Carl Sagan explores a series of events eventually leading to a kind of ending that makes the readers feel happy and appreciable for the life they had through this 320 page work. Normally I prefer Nonfiction over Fiction with an exception when it is science based or inspired. And this book is my first YA kind, at first the cover impressed me and after reading the description, i felt confident enough to try it and I'm glad i did it. It's very different from the conventional varieties of it. I could feel some pretty inspirations as well as pretty much enthusiasm from Carl Sagan, Antoine de saint Exupery, Elon Musk and many oblivious people. The story went real nice that i felt confident enough about the well-being of the characters right from the beginning even though some odds are thrown by the author for the suspense. The background of the characters and events are so rich in experience and provided so much easiness in reading. However I felt the experience was richer in the first half of the book. The kid, Alex Petrovski "recording the events in his ipod" style narration is very very nice to read and considerably affected by the kid's perspective of Innocent wisdom. The philosophical - inferential part deserves much appreciation referring the contexts of science as a sheer source of spirituality. Not much science in the plot, only the philosophical understandings from sentient perspective. So people with diverse interests can find it comfortable to read especially people who don't give a thing about science. "Do you think there are intelligent beings out there in the cosmos who don’t have sadness?" "I looked out the window again and we were even higher, and I couldn’t tell where the roads and buildings were anymore and it was just like my hero said, that from a certain height you can’t even tell there’s intelligent life on our own planet. So if you guys come to Earth, make sure you look closely enough." 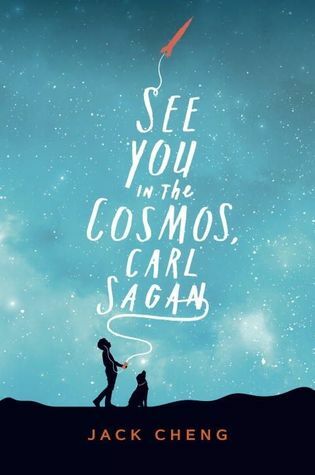 Overall it's the kind of book which you can gift to your middle grade kids and shall also be read by yourselves for pretty much soothing and relaxing break time read presuming you've already come through a lot of science stuffs; If not, it could be revelational for you as well. The book's available from February 27, 2017. 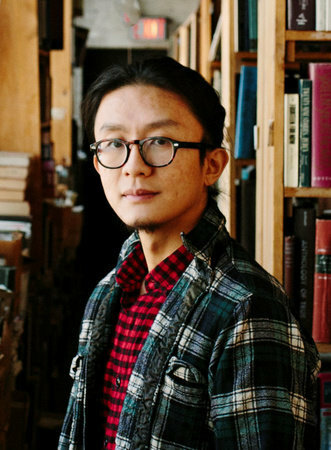 The Author Jack Cheng is most likely to become my second favorite Cheng after Ronnie Cheing and of course i left the 'i' but I feel more or less the same. He has experiences working in advertisement marketing firms and nothing much about books but I do expect a lot from the author in the upcoming adventures. Alex Petroski loves space and rockets. All he wants is to launch his golden iPod into space the way Carl Sagan launched his Golden Record on the Voyager spacecraft in 1977. From Colorado to New Mexico, Las Vegas to L.A., Alex records a journey on his iPod to show other lifeforms what life on earth, his earth, is like. As soon as I heard about this book, I was intrigued. I loved the concept of a middle-grade novel introducing child readers to the wonders of the universe, and the idea of life beyo Alex Petroski loves space and rockets. All he wants is to launch his golden iPod into space the way Carl Sagan launched his Golden Record on the Voyager spacecraft in 1977. From Colorado to New Mexico, Las Vegas to L.A., Alex records a journey on his iPod to show other lifeforms what life on earth, his earth, is like. As soon as I heard about this book, I was intrigued. I loved the concept of a middle-grade novel introducing child readers to the wonders of the universe, and the idea of life beyond Earth. Unfortunately, while Cheng does do an excellent job of instilling that sense of awe in his readers, I was disappointed by the little details of Alex’s story. See You in the Cosmos wasn’t badly written, but as someone who works with children of all ages Alex’s voice didn’t feel authentic to me for several reasons. Firstly, Alex seemed much, much younger than eleven. Secondly, he didn’t even sound like a real child - instead, he sounded like an adult attempting to write from the perspective of a child. I think adults who read kidlit will enjoy reading Alex’s endless monologue, but I doubt many child readers will be able to identify with him. Cheng’s portrayal of a child suffering from neglect also didn’t ring true. Neglected children often take on the role of caretaker for their parents, and feel compelled to protect them by lying about the lack of care they receive at home. But although Alex acts as his mother’s caretaker, he is seemingly oblivious of the fact that his home situation isn’t normal, and immediately reveals the extent of his mother’s abuse to all the adults he meets. To me, this came across as a very simplistic and misinformed portrayal of neglect. I’m also tired of the abusive-character-is-secretly-mentally-ill trope. It’s overused and usually distasteful. Nevertheless, a few things kept me reading See You in the Cosmos. Alex’s enthusiasm for science was wonderful, as was his obsession with the late great Carl Sagan. I also liked that the book was written in the style of voice recordings - and not just any voice recording, but a recording intended to be listened to be alien life forms. Ultimately, I don’t recommend See You in the Cosmos, but I liked many of the ideas behind this book and I’m open to reading more from Cheng in the future. Many thanks to Puffin Books for providing a copy of See You in the Cosmos. The opinions expressed in this review are my own. See You in the Cosmos will be released on February 28th in the U.S. and March 2nd in the U.K.
Auf "Hallo Leben, hörst du mich?" bin ich gestoßen, weil das Buch laut Verlag besonders Leser von John Green ansprechen soll. Da ich ein großer Fan von John Green bin, hatte ich deshalb enorm hohe Erwartungen an die Geschichte und muss sagen, dass ich letztendlich doch enttäuscht wurde. Zwar ist die Geschichte an sich nicht schlecht, mir allerdings viel zu einfach gehalten. Laut Verlag ist das Buch für Leser ab 12 Jahren geeignet, hier hatte ich jedoch vermehrt das Gefühl, als wäre es eher ein K Auf "Hallo Leben, hörst du mich?" bin ich gestoßen, weil das Buch laut Verlag besonders Leser von John Green ansprechen soll. Da ich ein großer Fan von John Green bin, hatte ich deshalb enorm hohe Erwartungen an die Geschichte und muss sagen, dass ich letztendlich doch enttäuscht wurde. Zwar ist die Geschichte an sich nicht schlecht, mir allerdings viel zu einfach gehalten. Laut Verlag ist das Buch für Leser ab 12 Jahren geeignet, hier hatte ich jedoch vermehrt das Gefühl, als wäre es eher ein Kinder- statt ein Jugendbuch, denn der Autor besitzt einen sehr einfach gehaltenen Schreibstil, der doch insgesamt sehr anspruchslos ist. Die Geschichte liest sich zwar an sich leicht und flüssig, aber dennoch habe ich mir hier auch aufgrund der Thematik mehr Anspruch gewünscht. Die Geschichte ist dabei schnell erzählt: Der 11-jährige Alex ist oftmals sehr allein, da seine Mutter krank ist und sich nicht um ihn kümmern kann. Dabei kommt ihm die Idee, dass er seinen iPod ins Weltall schießen möchte, um Aliens die Erde zu erklären. Zusammen mit seinem Hund Carl begibt er sich auf eine Reise, um an einer Convention teilzunehmen, bei denen Menschen zusammentreffen, die ebenfalls großes Interesse an dem Weltall haben. Dass er dabei auf die verschiedensten Menschen trifft und die ein oder andere Freundschaft schließt, bleibt dabei auch nicht aus. An sich ist die Grundidee des Autors nicht schlecht, allerdings konnte mich die Umsetzung nur wenig begeistern, da mir oftmals der Anspruch und die Tiefe gefehlt hat, die das Buch bitter nötig gehabt hätte. Alex wirkt mit seinen elf Jahren oftmals sehr unreif und ich hatte stellenweise das Gefühl, als wäre er deutlich jünger, was die Geschichte für mich unglaubwürdig machte. Selbiges gilt leider auch für alle anderen Figuren, die für mich bis zum Schluss unnahbar blieben. Das Cover ist dagegen wunderschön und hat mich direkt angesprochen, sodass ich neugierig wurde und mehr erfahren wollte. Gleiches gilt auch für die Kurzbeschreibung, die sehr gelungen ist und aus der man das Beste herausgeholt hat. Sehr schade, dass das Buch letztendlich nicht mithalten konnte. When I requested this book I did it because it was about a kid in love with space. I love space but trust me I don’t love it as much as Alex does. That kid knows everything there is to know about rockets, planets and space in general. He even built his own rocket and is making recordings to send to outer space so that aliens can know in advance how is life on Earth. Alex is only eleven years old but thirteen in responsibility years, or so he says and I believe him. He is one wise and mature young fellow. Smart and self sufficient, he takes care of his mother and his puppy named after his hero, Carl Sagan. He loves space so much he is going to New Mexico by himself to fly his rocket. He is going to put his Golden iPod inside with all the recordings he’s being doing. He is an adorable boy, really honest and straightforward. It’s only natural people want to help him and find themselves somehow involved in his adventures. Alex is a special boy and he is very imaginative. You can’t help but love him and cheer for him to achieve whatever dream he wants to achieve. You need to know everything is going to be ok and when you start to understand his life isn’t without its complications you can’t help but be worried. I know I had wet eyes during a couple of parts and it was really hard holding back my tears. Alex deserves the world, or better, he deserves the universe and I was going to fight all the people putting obstacles in his way. I love you, Alex! At first I didn’t know if the way this book is written was going to be of my liking. This book is written in recordings. Everything you read is part of the recordings Alex is planning to send to outer space. It was different, I can’t deny that, because you only knew what Alex told you, his side and interpretation of what he was experiencing but his voice was so pure that no matter how different it felt, it also felt right. After finishing the book I know I wouldn’t have wanted the story written in any other way. I was just curious about Middle-grade fiction, I wasn't expecting to be on a week-long book hangover after reading this. Let's be honest: Middle-grade fiction is REALLY GOOD. This book was exceptional. As in, really really really exceptional. In the best way. Ever. Because it was about an 11-year-old, I was kinda like, "This should be interesting in an uninteresting way." Idek why I got it from the library. Maybe the title convinced me? I do like the title. ANYWAYS. I was shocked at how much I loved this book! I was completely taken unaware and just out of nowhere I was like SO EMOTIONAL at the end. I didn't want it to end. Ever. Just Alex's voice and the overall plot and just.... UGH. So that's why I bought this one. Emotional attachment and all that. This is a powerful novel, never underestimate Middle-grade fiction. It'll tear your heart to shreds when you're not looking.